Back necklace, tangara taxidermy, cotton string. 1930s, the Jívaro, Ecuador. Photo: Ilari Järvinen, The Finnish Heritage Agency. The Inherit the Dust photo exhibition opening at the National Museum of Finland will be accompanied by a smaller exhibition entitled Traces. 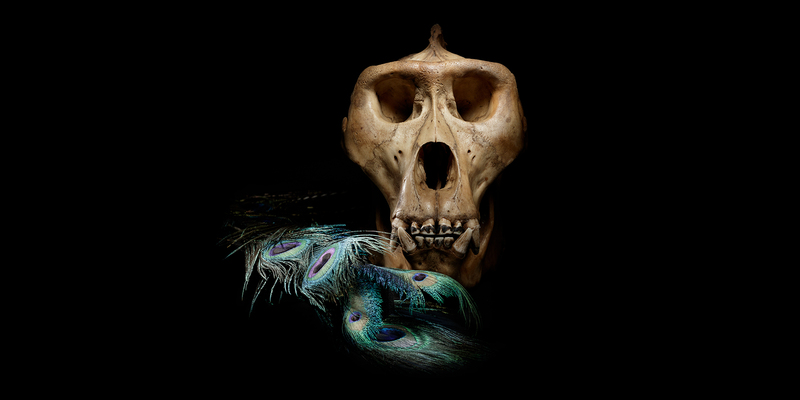 This exhibition features a variety of items selected from the National Museum of Finland’s collections, consisting of both natural science specimens and objects made of animal materials from all continents – from Siberia to Africa and from the Pacific to Europe. The objects on display include items made of ivory, feathers, furs and tortoise shells from different parts of the world. Traces illustrates the myriad ways in which, regardless of time and place, people have used animals as driving forces in their cultures. For a long time, this interaction was equal – animals, like people, were considered individuals that wielded their own power in the shared living environment. Over time, however, man started to think of himself as above animals, as the defining species of the world aboveground. Today, human influence extends to nearly all animals everywhere in the world. Because of humans, many species of animals have become extinct, threatened or severely endangered. The ongoing sixth mass extinction is the first mass extinction caused by humans, with climate change, in particular, affecting the survival prospects of animals living in the wild. The intrinsic value of animals and human responsibility are also worth discussing – do animals have value only in relation to people? And what does the relationship with humans mean to animals? “We, as humans, should take our hat off to every elephant, howler monkey, leopard and polar bear whose body parts the exhibition’s items were made out of,” states Curator Pilvi Vainonen from the National Museum of Finland, who is responsible for the exhibition’s script. By tackling such a much-discussed topic, the exhibition also serves to document contemporary culture and the ways in which it frames issues. The exhibition’s themes include the role of animals in human beliefs, hunting and trading, animals in work, exoticism and the leisure use of animals, poaching and smuggling, human responsibility and animal protection. The exhibition includes an accompanying publication entitled Jälkiä – Spår – Traces, which is available for purchase at the National Museum of Finland’s museum shop. The Traces exhibition produced by the National Museum of Finland will run from 5 April to 4 August 2019. The Inherit the Dust exhibition produced by the National Museum of Finland in collaboration with Fotografiska will run from 5 April to 1 September 2019.